Born in Leicester, and educated at Alderman Newton’s School, Edgar Tyler was prominent in many areas of the City’s educational, cultural and business life for more than sixty years. He was a founder member of the Leicester Branch of the Workers Educational Association (WEA) when it was established in 1919, and serving as the elected secretary of a tutorial class he was attending he became of member of the Branch Council in 1922, soon also joining the Branch Executive. He was Branch Chairman for over half a century from 1931 through to his death at the age of 88, also joining the East Midlands District Committee and eventually serving as District Chairman from 1959 to 1979. On his retirement as District Chairman the WEA recorded that his period as Chairman had been “marked by his gentleness of manner, his fair-mindedness and his impeccable conduct of District meetings…. 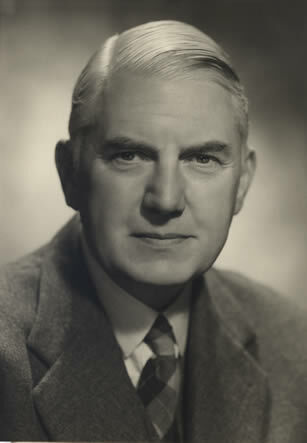 despite his great energy on behalf of the Association, Edgar Tyler was not a firebrand but preferred to handle controversy with sweet reason”. Also within adult education he served for many years on the Further Education Subcommittee of the Leicester City Council, and was closely associated with the University of Leicester’s Vaughan College, serving also on Committees and the Court of the University. For his services to adult education the University conferred on him the degree of Master of Arts Honoris Causa in 1969, describing him as “one who in high measure represents the adult education virtues”. He joined the Lit. and Phil. when this was also revived in 1945 after the break for World War II and in addition to his year of office as President he was a member of the Council through to his death. He was also a major force locally in many other organisations, including the chairing Leicestershire Footpaths Association while in the Ramblers Association he was for President of the Leicester Branch from 1931 and Chairman of the East Midlands District from 1939. Within both he was a stalwart campaigner for footpaths and common land, and public access to open country. Other organisations which he gave long service as a Committee member and in most cases President, included the Leicester and Leicestershire Photographic Society (he was a noted landscape photographer), the Leicestershire Local History Council, the Vaughan Archaeological Society and the Leicester Branch of the National Trust.